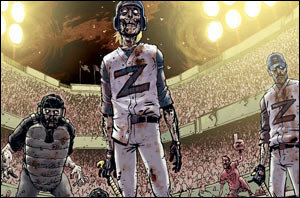 Key of Z – New Zombie Apocalypse Comic Book Series | We Zombie! ComicBookResources has a great interview with Claudio Sanchez about the new zombie apocalypse comic book series from Evil Ink Comics and BOOM! Studios. The story takes place in New York, where most survivors have holed up in one of three major centers: Yankee Stadium, Citi Field and Madison Square Garden. Each of these centers has its own idea of how the future should work, and along comes Ewing, a security guard whose family was killed. He’s out for revenge, but also something more as he holds the key to something that might be able to control the zombies – a harmonica. Sounds pretty cool – can’t wait to get my hands on the first book. Check out the interview to learn more.